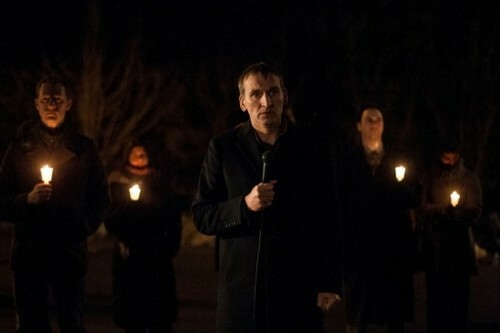 Tonight on HBO is the much anticipated THE LEFTOVERS continues with another new episode. On tonight’s episode called, “Gladys,” a vicious hate crime tests Laurie’s resolve; Kevin mulls an outside offer for help to rid Mapleton of its problems; Matt takes his sermon to the street; Meg assumes a new role. On last episode a holiday display went wanting, sending Kevin scurrying to find out who was responsible. Tom and Christine ran into trouble at a hospital and on the road. Kevin retrieved a surprise detainee from a neighboring police station, and received unexpected visitors at home. The Guilty Remnant put its stamp on the holiday season. On tonight’s show, Laurie’s resolve is put to the test in the wake of a brutal hate crime. After his latest initiatives to maintain the peace in Mapleton fall short, Kevin turns down an outside offer to rid the town of its problems. Matt brings his pulpit to the street. Meg takes on a new role. Tonight’s season 1 episode 5 is going to be an exciting one, which you won’t want to miss. So be sure to tune in for our live coverage of HBO’s The Leftovers season premiere tonight at 10 PM EST! RECAP: We see Gladys walking around the streets and over to a gas station, she is then grabbed by two people and thrown into the forest; they start dragging her around and tie her to a tree. The people in dark clothes start throwing rocks at her, she is bleeding like crazy covered in blood; the guys keep throwing more rocks at her as she begs them to stop. Meg comes out asking what’s going on with all the girls going away, she asks if she can help them; they all go out trying to find Gladys. They are all in the forest now with flash lights looking for he, a bunch of dogs going running into the forest and a man pulls out his rifle and shoots the two of them. They now walk over to the tree to find Gladys stoned to death, she is covered in blood, Kevin wakes up and gets dressed. He goes to ask his daughter if she wants to go to school; Kevin goes to answer the door and finds Amanda telling him about Gladys’ death. Meg asks them if they are surprised, the girls don’t answer he and the two start to smoke together. The woman she’s with starts having some sort of and attack, she can’t breath and is collapsing. Kevin comes to the scene of the crime, he tells the other girls to keep off the streets. Kevin walks on over to Dean and asks him what he was doing, Dean says he was drinking beer and star gazing. Kevin comes to the school and Jill starts breaking down in tears thinking something happened to their mother, he says he’s only there to talk about a woman being attacked and wants Jill to get home and not go out late. Kevin is at the department talking about what he found and he gets really angry at the detective and wants to beat him up, he is really angry. Kevin demands a curfew for the people in the town so that that no one else gets hurt like Gladys did. Laurie sits down and is told to take a day off from not speaking; to go ahead and speak for what has been 8 months long of no talking. Kevin is getting his shirts at the dry cleaners, though he has no white shirts at home; someone is sneaking into his house and taking his shirts. Kevin arrives to the department and sees Matt there, he asks Matt where he was two nights ago. Matt asks why, Kevin says he had a rock thrown at him once. Matt asks if the woman had any family, he mentions how he saw her a lot and she never talked at all Matt asks to see her body. Matt says he’d like to pray for the woman even if he is a suspect, Kevin says no. Kevin is called out to go see the mayor about his curfew idea; Kevin says they all are aware about the hate crime that happened two nights ago and believes it would be best for people to remain at home at 8pm. Kevin is mentioning how he wants to keep everyone safe, Dean mentions how it isn’t safe since they didn’t do anything wrong. Lucy mentions she is all in favor for Kevin’s idea and the council totally agrees against him, Kevin tells a silent man to get Patti and all the people from the house gathered. Kevin mentions that it is open season on them, he goes and gives them whistles if they get in trouble and that they don’t have to get in trouble again; Kevin asks them if they have any questions. Nobody answers him and he goes over to Meg asking where Laurie is, Meg says she doesn’t know. Kevin walks on over to a house and knocks on the door, he is welcomed in to see Matt and a bunch of people; Kevin tells Matt to come with him to pray for the girl. Kevin brings Matt to the body and there is no one inside it, she was shipped out to Virginia; Kevin calls Shaun threatening to kill him if he doesn’t call him back. Kevin comes home and is trying to disarm the alarm, he pressed the wrong button and it goes off; he gets a call but is getting pissed off over the alarm; he disarms it and the guy Shaun calls him again. Kevin tells Shaun that someone jumped the gun when calling him, Kevin says for Shaun to send the body back but mentions someone else took her. Kevin is now at the grocery store picking up some beer, he gets the beer and is outside going to his car now; he notices a diner with some guy on the phone. Kevin walks on over and asks the guy in the dry cleaning to open the door, he starts hitting the window constantly for the guy to open the door. He opens the door and the guy begs for it to be simple; he wants him to go look for the shirts. The guy gives him the shirts and then Kevin leaves saying thanks. Matt is outside of the house of the silent women and with a megaphone starts talking to them; mentioning how he tried to help her once but refused him. Laurie goes outside and Matt starts to smile, she starts walking over to him and is blowing her whistle at him constantly. Kevin is now home and goes to hang up his white shirts, Jill comes in and he thanks her for setting the alarm. Kevin mentions how he plans to divorce her mother, he starts to cry. We now see a group of men open up the corpse of Gladys. They put it through a furnace, burning whatever evidence of the woman.